He’s come back to the Bulls this season with a master’s degree, a master of the mid-range game. It was on display Tuesday as with Derrick Rose out with a sprained ankle and Joakim Noah ill, Butler scored 21 points along with nine rebounds, three assists and two blocks to help lead the Bulls to a 98-90 victory over the Orlando Magic. There were highlights all around with the Bulls going to 3-1 against the winless Magic by pulling away from a two-point deficit with 10 minutes remaining with a brilliant defensive stand and 9-0 run over three minutes that enabled the Bulls to hold off Orlando the rest of the way. Gibson added 16 points despite his foul problems along with two blocks among the Bulls’ nine as the Bulls lead the league in blocks. But it was once again the crucial scoring of Butler’s, especially getting to the free throw line with his power from the mid post that has been striking. In his two games back from his thumb injury, Butler has led the Bulls in scoring each time and has a whopping 26 free throw attempts in the two games. His strength, quickness and footwork remind you of, well, it just seems suddenly familiar. “I’m not saying I am him, but I watched a lot of film this summer on Mike (Jordan) and Kobe (Bryant) and their footwork and how they play right there (in the mid-post),” said Butler. “It’s where I want to get to. I still have a long way to go, don’t get me wrong, to get to their level. But it’s a good start. It’s what I tried to work the most on this summer, the mid-post. And it doesn’t get that much better than Butler has been playing with strength, confidence and aggression. He identified mismatches quickly, and though he’s not a knockdown shooter as yet, his shot looks much improved and he’s stepping into it with confidence. One difference, said Butler, is he realized he needed to lose some weight. He feels strong, but quicker. 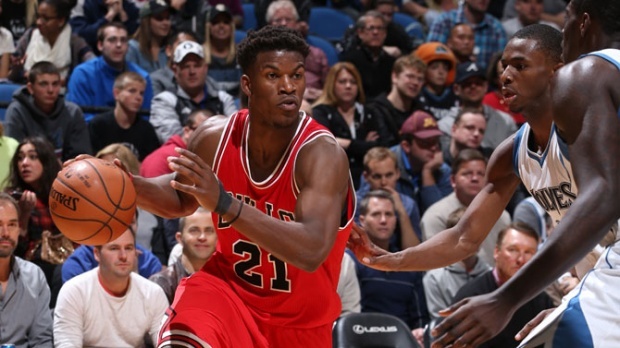 Butler was only seven of 11 from the free throw line Tuesday after 11 of 15 in Minnesota Saturday. But indicative of the player he is becoming—and looking like an All-Star candidate—Butler is only thinking about the work. The Bulls haven’t been missing much this season except, well, unless you consider their star point guard. Rose sat out his second consecutive game after spraining his ankle last week against the Cavaliers. Rose worked out before the game, but was declared out moments before the start. Thibodeau said the ankle wasn’t fully healed and had nothing to do with the start of a four games in five nights stretch. Earlier Tuesday after the team practice, Rose indicated he wasn’t able to push off quite right. Given Rose’s well known injury history, the team is urging caution this season. But Butler, who had six points in the fourth quarter including a lob dunk on a Kirk Hinrich inbounds pass to give the Bulls a 94-86 lead with 2:13 left, said Rose did help with some fourth quarter inspiration. It wasn’t clear whether the Bulls could win during a back and forth game the Bulls led 54-52 at halftime and were tied at 69 going into the fourth quarter. The Magic was led by Tobias Harris with 21 points and Vucevic with 19 points and 13 rebounds, though the Bulls closed them down late with brilliant defensive play. It was an uneven start for the Bulls as Orlando led 16-8; the defense was slow to react again early, though that would change. Gasol got going late in the first to get within 28-24, though the Magic was hitting at 57.1 percent. The second quarter saw McDermott’s best run of the season as he started with a three with the Bulls trailing 33-26, got a shot blocked but came back with strong drive from the top and layup, a slice cut and dunk on a nifty pass from Mirotic and then another from Brooks that led to a three-point play. Then Butler took over, backing in former Bull Ben Gordon as soon as he made the switch onto him twice and then closing the quarter with a runner after a Kirk Hinrich behind the back dribble and pass. Both teams bumbled to start the second half and set up the final quarter for the game. The Bulls took it away with one terrific defensive play after another: Brooks strip, Gibson block, Hinrich with a steal, Brooks with a block, Gibson another block. While that was going on, Gibson went up strong on a pass from Hinrich, Tony Snell had a driving layup, Hinrich scored on a drive, Mirotic made a three on a Gibson pass and added another in a two-man game with Brooks. It also was the little things, like Hinrich getting caught inside on a switch guarding Vucevic. But Hinrich fought so hard fronting Vucevic that Orlando couldn’t get the pass in and passed around the other side for a miss. “You can’t say enough about what Hinrich does for our team,” said Thibodeau. Orlando did fight back with rookie Elfrid Payton on a drive and Vucevic getting deep position on Gasol, which was an issue all game. But then as Orlando nudged within 89-86 with 3:09 left after a Harris 18 footer and Butler miss, Brooks made the defensive play of the game sliding in from the weak side to help with Vucevic about to score again. The barely six-foot Brooks blocked the seven footer as he tried to come up with the ball. The Bulls then found Gasol deep and as the Magic defense sank in, Gasol passed out for Brooks’ three to make it 92-86. It would prove enough points for the win. “Aaron, his defense today was his best game, ball pressure, challenging shots, multiple effort, getting into the post,” said Thibodeau. “We want him to play both sides of the ball. He’s capable. He’s a tough guy. You can see it. He’s not afraid to get in there and mix it up with everybody; he’s capable of playing great defense. He’s a big shot maker, he’s clever, has all the tricks. If you’re a guard that size you have to figure how you are going to get the shot over the bigs. He does with great touch and accuracy. Tonight his shot wasn’t there early on; he made plays, seven assists in the first half. He’s a high IQ guy; he knows the strengths and weaknesses of every guy he’s playing and that’s critical.